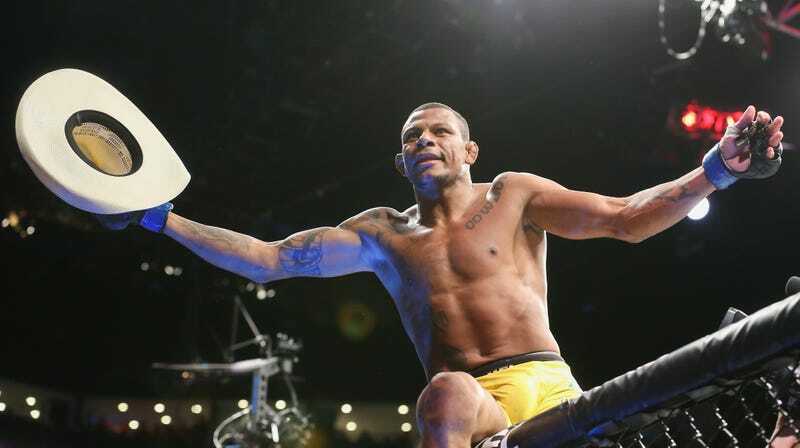 UFC welterweight Alex Oliveira went home to Tres Rios, south of Rio de Janeiro, to spend Christmas with family. There he was involved in a Christmas Eve altercation at a gas station, involving machetes and guns and an exploding grenade that lodged a handful of shrapnel in his lower leg, requiring surgery. Oliveira was reportedly able to transport himself to “the Emergency Care Unit of the city,” where he underwent “minor surgery” to have fragments OF A GRENADE removed from his lower leg. He is otherwise fine, and was home later that night. There’s a not-gross image of Oliveira’s bandaged leg on Globo, and it seems like he was very lucky that his injuries were so minor—once again I would like to emphasize that he was at a gas station when someone threw a grenade at him, and it exploded. As pointed out by MMA Fighting, Oliveira needed 38 stitches in his head after his fight against Gunnar Nelson on December 8, so he’s having a really terrific month.